Many of the most famous areas of the city are easily accessible from the nearby Metro. The Sofia Hotel Prague is only a few stops away from the famous Wenceslas Square, as well as a number of other historical locations. Shops and restaurants are also found in neighborhoods in the area. 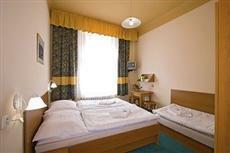 The Sofia Hotel Prague is located 15 kilometers from the international airport and is very close to the Metro. Because of the proximity of public transportation, visitors will easily be able to reach all of the attractions and museums in Prague. The rooms in The Sofia Hotel Prague are modernly furnished and offer hairdryers, televisions, safe deposit boxes, coffeemakers, and more. Pets are allowed at the hotel as well. The Sofia Hotel Prague is located in a residential area in the center of the city very close to the Metro, making it easy to reach all of the major sights that the city of Prague has to offer. The hotel offers a buffet breakfast each morning, and there is Internet access located in the lobby of the hotel.